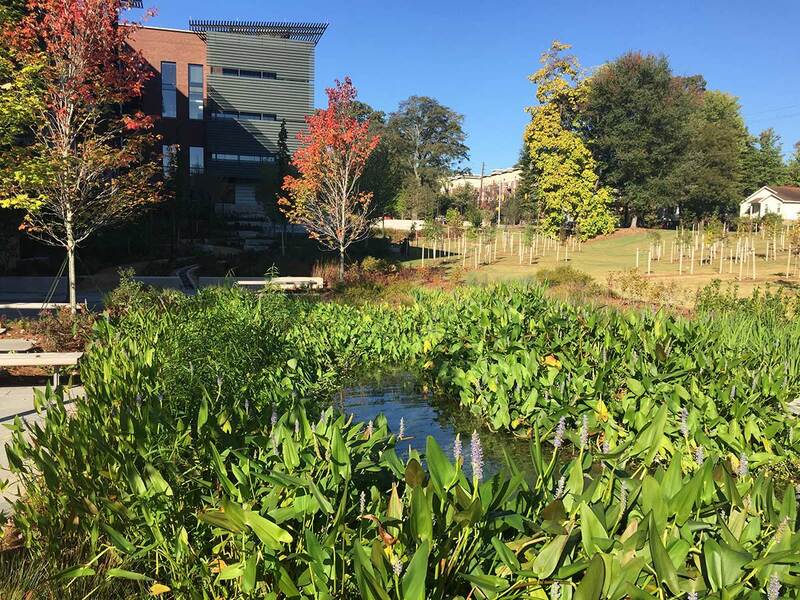 This article was originally posted on July 12, 2018 on The Field blog, hosted by the American Society of Landscape Architects, and authored by members of the ASLA Professional Practice Networks. In our field, resilience and sustainability should mean the same thing, but this means that we need to correct how we talk about sustainability. Perhaps the most striking similarity between our current use of the terms “sustainability” and “resilience” is their frequent application across a wide variety of practices and projects that too often are neither sustainable nor resilient. This is the way of terms of art—they burst onto the scene, meaning something important and specific, but over time their power becomes diluted as they get misused or applied loosely. I argue that if we use the term sustainability correctly, all sustainable projects would also be resilient, i.e. able to accommodate change and recover quickly. But to see why this is the case, we need to examine the concept of “sustainability” within the design profession and see why the term is frequently misapplied. Although sustainability predates John Elkington’s coining of the phrase, “the triple bottom line” (3BL), his concept overly influences how we talk about sustainability today. In developing the 3BL model, he argued that companies should not only look at profit, but also consider people and planet. His intent was for companies to use the 3BL to measure their economic, cultural, and environmental performance over a period of time. It does not mean that a company, a product, or even a community is ‘sustainable’ if they adopt the 3BL. It only means that impacts and benefits associated with environment and culture should be evaluated alongside the traditional economic metric of profitability. Unfortunately, this 3BL framework has been co-opted throughout the sustainability world in a model (at right) that suggests that operating at the intersection of these three bottom lines somehow equates to being ‘sustainable’. 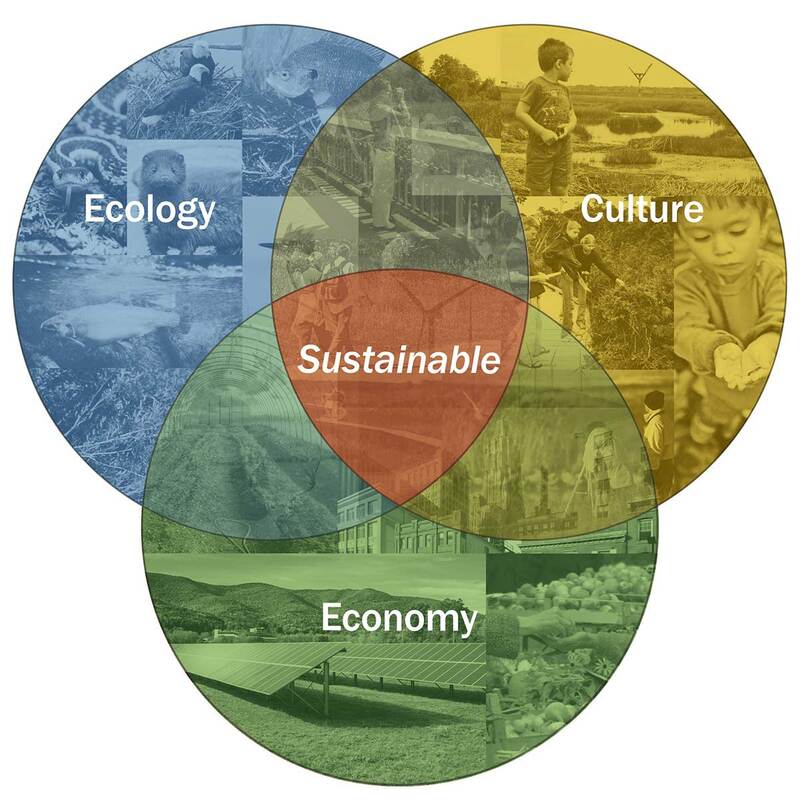 Because this weak model of sustainability places equal weight on each of the three elements, many of the projects considered “sustainable” would not be considered resilient. They might balance economic, cultural, and environmental performance, but be unable to accommodate change and recover quickly. The 3BL model of sustainability, however, does not truly define a sustainable system. But if we clarify the interrelationships among the three elements, we do not need a separate concept of resilience. In short, I argue that truly sustainable systems are also inherently resilient. The problem with the overlapping 3BL model of sustainability above is that it does not specify a hierarchy among the circles. If a system does not have a solid ecological foundation that is within the carrying capacity of planet Earth, it is not sustainable. Historical examples repeatedly show that resource depletion results in cultural instability that leads to economic failures. Jared Diamond develops several such examples, such as Easter Island and Haiti, in his book Collapse and in lectures. That culture is born of place underpins our efforts to design with a sense of place, but the concept is much stronger than that – that culture is born of place is an assertion about the necessary conditions for an intact and flourishing culture and therefore economy. While it offers great insight in terms of economic analysis, the 3BL model ill-serves the concept of sustainability. Instead, I propose a model of sustainability (below) that sees these systems as inherently nested and inextricable. 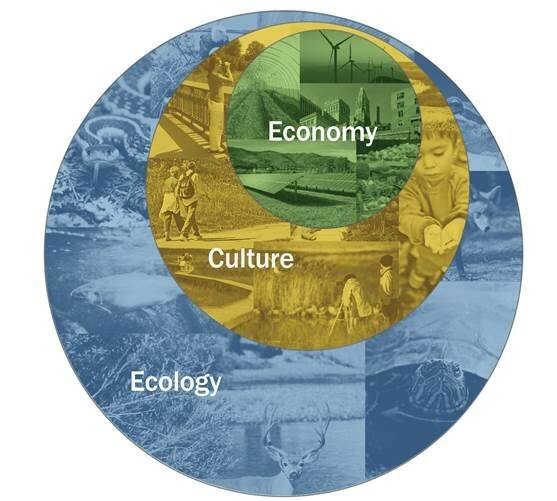 If culture derives in part from its ecological context and we recognize that it cannot flourish independent of place, and in turn, economic systems derive in part from their cultural context and we recognize that they cannot flourish independent of culture, then we are talking about true sustainability. Using this stronger, more coherent definition of sustainability, every truly sustainable project is inherently resilient. For example, no one, no matter how well-resourced and visionary, can build a sustainable building that is subjected to sea level rise or in a 100-year floodplain. There is no such thing as a sustainable building in these places. Buildings that rely on sea walls or levy systems or any grey infrastructure system that compromises the ecological integrity of their setting and impedes ecological function are not sustainable. Buildings that rely on natural infrastructure such as coastal wetlands, oyster beds, and submerged aquatic vegetation to offer protection from storm surges and sea level rise can be sustainable. Natural infrastructure supports and builds the ecological base that underpins sustainable culture and economy. As for resilience, the ability to accommodate change and recover quickly is a characteristic of sustainable projects that build from an ecologically sound base. As practitioners in this field, we have two ways to retain the power of these terms. We can either recognize that they lose their force with use and misuse and continue to reinvent or re-clothe the concept (i.e. continue the progression from “green” to “smart” to “sustainable” to “regenerative” design) or we can police their use and note when these terms are used in ways that make them flabby and weak. My inclination is the second, to defend a higher standard and decline to describe projects that disregard Earth’s carrying capacity or ecological integrity as “sustainable,” regardless of their certifications or energy use or any other single metric. Rewilding and the Musuem of Modern Art – Really!